How do your attendees know how awesome your event is if you don’t tell them? It’s time to send out an email marketing campaign so potential attendees know the hype is real. The more creative, the better. 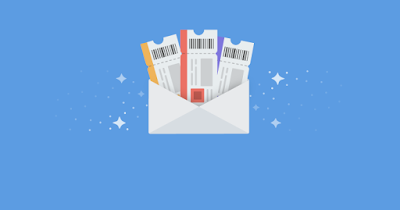 Creating an email plan to promote your event before, during, and after the event is an essential part of pre-planning. Here’s what you need to know to make sure your event-based email campaign works from start to finish. Who: Who will benefit from attending your event? Defining your target audience will make it easier to segment your list and craft copy that will entice them to sign up for your event. What: What does the event entail? Is it a webinar, meetup, conference, or Twitter chat? These all require completely different time and monetary commitments on the part of your subscriber, so make it clear what it is they’re signing up for. Where: Where is your event? Is it virtual or in-person? Are there multiple locations for your event, and if so, what’s the difference between them? When: When is the event taking place? At what time? On what day? Why: Explain exactly what’s in it for your subscribers by attending. What will they learn? Who will they meet? Why is it worth taking the time out of their busy workday to attend? It’s important to help them decide, but your subscribers also may have the challenge of convincing their boss. Adding a pre-built “justify your trip,” template letter helps your potential attendees make it to your event. This Sprout Social email is a great example of an event email that gets straight to the point, answering all of those questions in less than a paragraph of text. 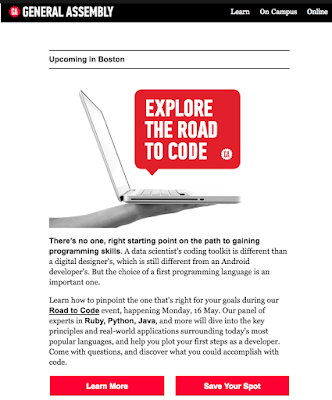 Check out the full email, including code, with Litmus Scope. 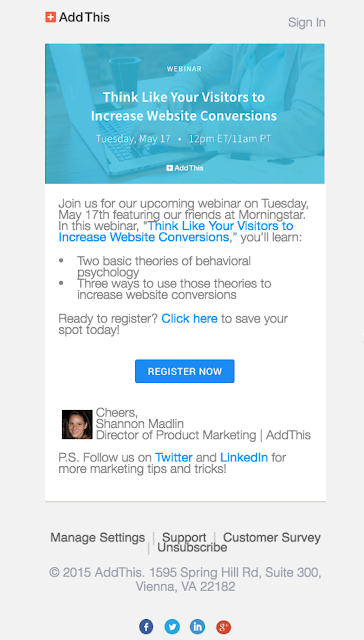 Include a CTA button that contrasts with the rest of your email. 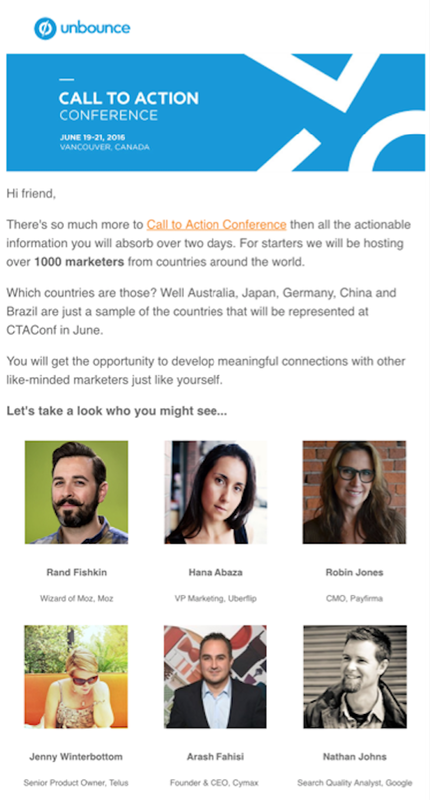 Amplify the value of your conference with the right CTA copy. Above all, personalize your message for its intended audience. 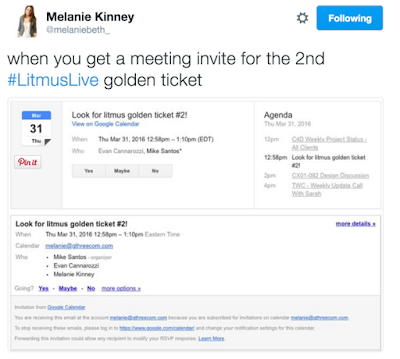 For Litmus Live, we wanted to reach out to attendees from our 2015 conference to let them know that tickets were still available but would soon sell out. To achieve this, we created an email with a personal letter format and segmented it by 2015 event location, making the message as relevant as possible for each subscriber. This example from Wistia captures the spirit of WistiaFest with this simple, yet powerful email. Adding a link to a video can add a personal touch and help you relive the magic of your event. In addition, providing previous attendees with a personalized discount code “NotMyFirstRodeo” personalizes the email, and shows previous attendees how much Wistia appreciated their attendance. To encourage subscribers to click, you have to create what psychologist George Loewenstein calls “the curiosity gap.” It’s when you learn—through a subject line or CTA—that you’re missing valuable knowledge. When you don’t know the answer, that creates a painful gap. So painful, in fact, that you have the urge to click through to learn more. The reason media outlets like Buzzfeed and Upworthy cover your social media feed with clickbait headlines is because…they work! 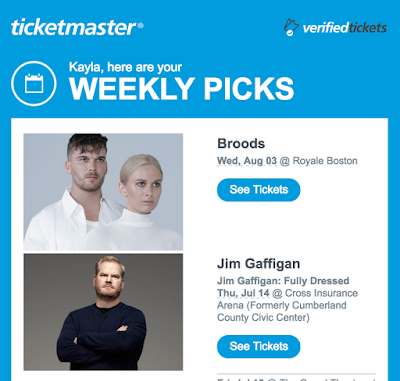 Now, we’re not suggesting to jump off the deep end with “Kim Kardashian Said Yes To This Event…And You’ll Never Guess What Happens Next!” But by adding this kind of gap into your copywriting, CTAs, or in the structure of the email itself, you can create an aura of mystery that generates excitement. 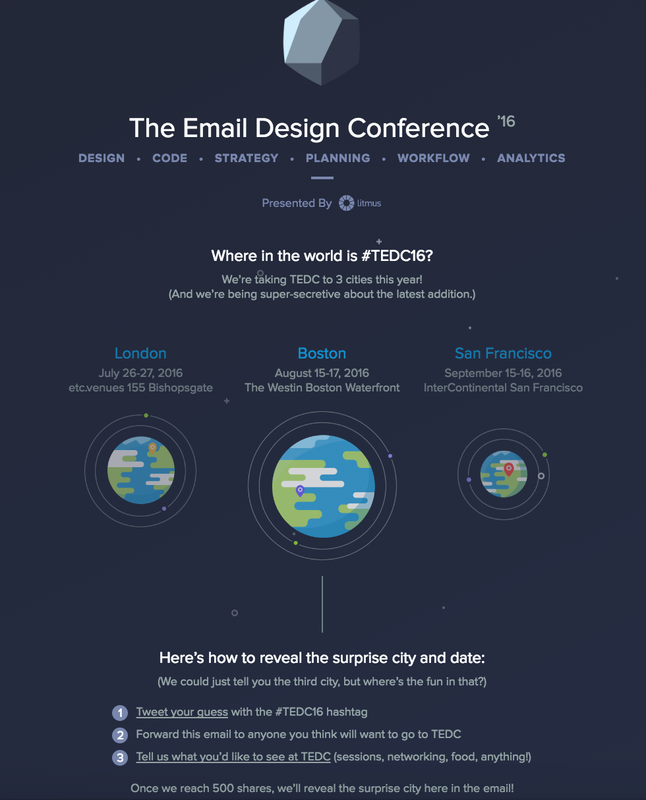 We put the curiosity gap into practice with our “Save the Date” email for TEDC16 when we purposely kept our third location a secret. We enlisted our entire community of subscribers and followers to reveal it to the world. 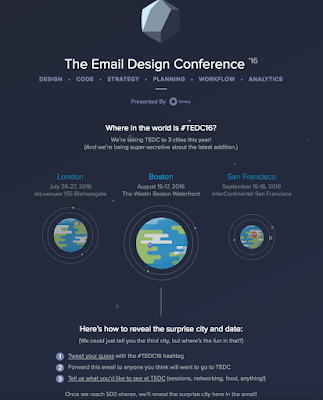 We designed the email so that to reveal the third city, subscribers had to forward, post to the Litmus Community, and tweet using our hashtag #TEDC16 (we’ve since changed it to #LitmusLive). Our subscribers were so excited that we received enough tweets to reveal the hidden city—San Francisco—in only 70 minutes! By exposing a curiosity gap—where our third location would be—we built up a ton of excitement for the conference. As a bonus, the guesses gave us great feedback on what locations to consider for TEDC17! 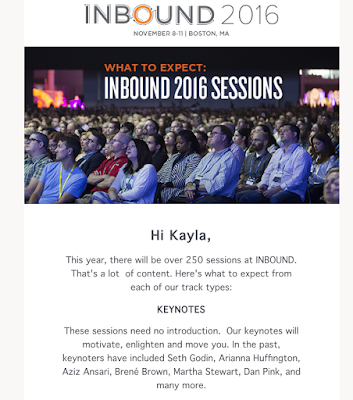 This Hubspot email, targeted to previous attendees of their yearly Inbound Conference, does this with their subject line: “What to expect from 250+ sessions at #INBOUND16.” Creating mystery and excitement doesn’t require a special contest or withholding information; in fact, this email does the opposite, laying out the structure of the conference and each track’s purpose. You’re curious enough to click; but then unlike those clickbait-y headlines, you’re rewarded with valuable, helpful information. This Unbounce CTA conference email does much of the same, with a subject line of “Who’s Attending CTA Conf 2016…let’s find out,” they’re putting the curiosity gap into practice.By revealing its agenda (and some big-name marketing attendees) they drum up excitement while adding a sense of urgency—come join us, before tickets are all gone! Even in the age of social media, there’s still nothing better than focusing on the personal, 1:1 dimensions of sharing. Encouraging email forwarding and sharing is an essential part of building your attendee base. 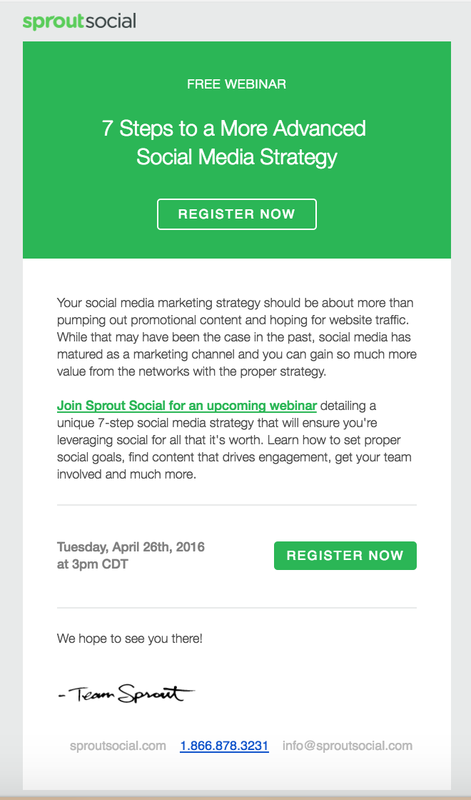 Event emails are naturally more shareable. According to our Viral Email Report, events that require registration or an RSVP more commonly go viral, about 3.2 times more likely. Events are naturally social (and urgent—registration can sell out!). Though it’s great to meet new people, chances are you’re interested in attending with someone else. That’s part of the fun! When you do receive an invitation to a webinar or meetup that you can’t make, you’re more likely to forward to a friend or coworker and say “Hey! Did you hear about this? Sounds fun, wish I could go!” than any other type of email. As an email marketer, make it easy for your subscribers to do just that. Making your email more shareable can also come from your offer. 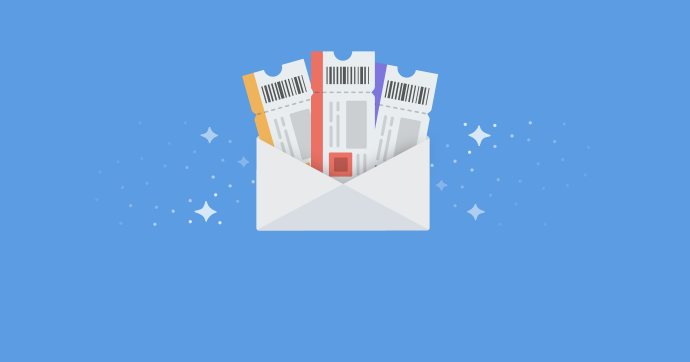 If your event offers group pricing or referral bonuses, be sure to highlight these in your email to further leverage forwards and to build the reach of potential attendees. For the past two years, we’ve launched our TEDC ticket sales with with an email promoting a golden ticket contest. 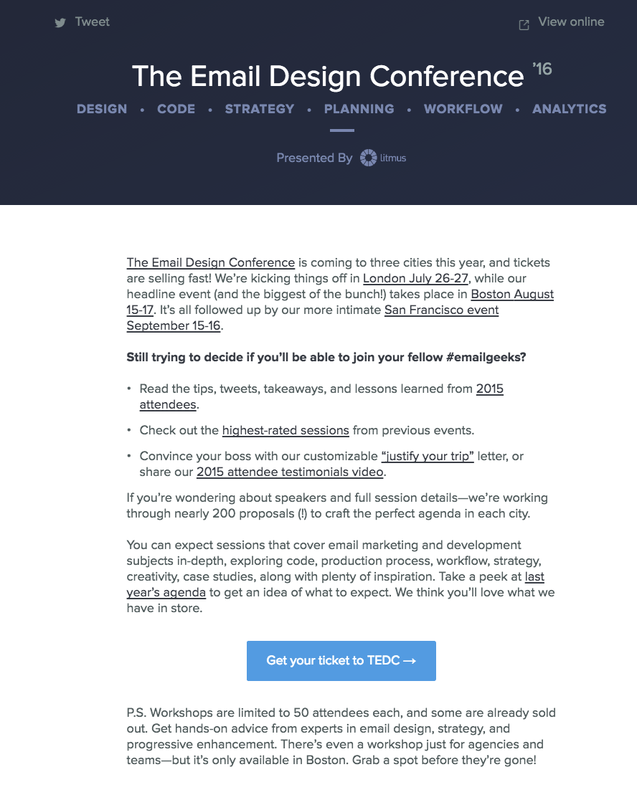 It’s a chance for #emailgeeks to win a ticket to TEDC, but also a fun opportunity for everyone to share their excitement on social media. To win a ticket, subscribers needed to find the hidden challenges within the email, and then tweet the correct answer to be considered to win. See the complete email, including code, with Litmus Scope. We staggered the guesses over the course of two days to give everyone a chance to play, and randomly chose a winner for each interval. We expected excitement, but we didn’t expect our followers to drop everything to do this contest. By adding in a social element like the golden ticket contest, we were able to generate a ton of excitement for this year’s event across our community and on social media. As mobile email opens consistently stay above 50%, it’s increasingly clear that email campaigns need to be designed with mobile subscribers in mind. Desktop-only email campaigns are quickly being relegated to the dust bin, as subscribers expect great experiences no matter where they are or what device they’re using. If you’re sending emails during your event, your subscribers will be on the move—attending sessions, networking, in transit, or at a hotel—making your emails mobile-friendly is essential to the health of of your campaign. You can use two different techniques to make your email mobile-friendly: responsive and hybrid. Responsive coding uses fluid tables, fluid images, and media queries to control the layout of an email across different device sizes. Hybrid, or “spongy” coding, still uses fluid tables and images but, in contrast to responsive emails, those tables and images are fluid by default. Instead of using media queries to trigger those fluid states on smaller screens, hybrid coding favors Microsoft conditional comments to restrain fluid tables on larger screens. Both ways provide your user the ability to seamlessly experience their email no matter where they are—which is more important than ever for any email campaign. With mobile, every line counts. To make sure that your subscribers read more of your email, keep it short and to the point. This General Assembly email is a great example of that: It explains the event, why you should attend, and how to register immediately. We’re all busy people. 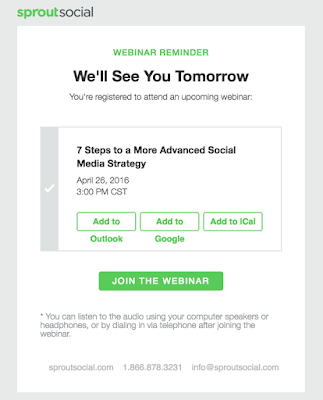 Including a reminder email can make sure your attendees actually come. 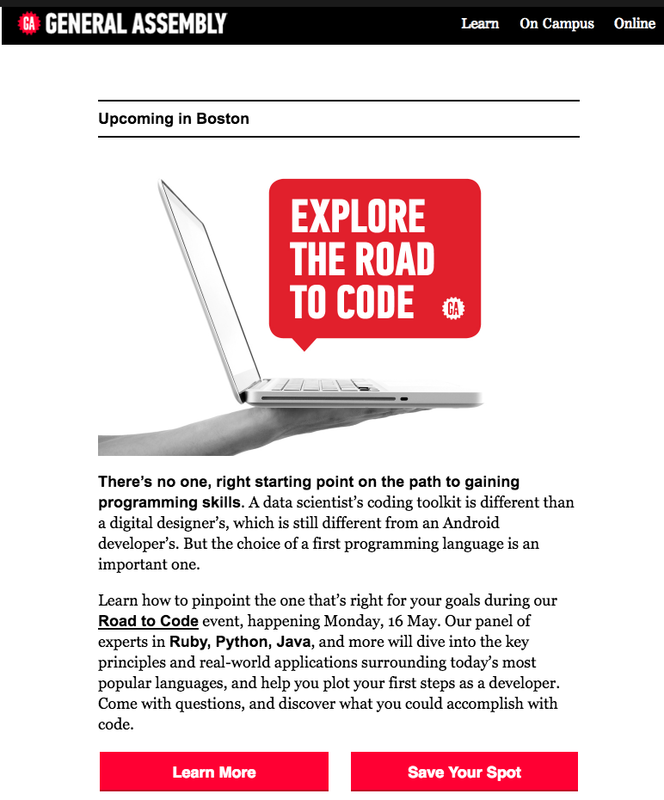 Check out the email, including the code, with Litmus Scope. 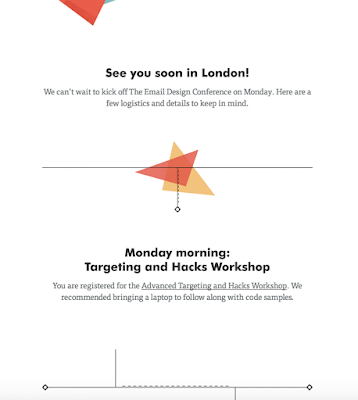 For Litmus Live in 2015, we sent one final reminder three days before the conference, containing everything the attendees needed to know: key agenda items, logistics, special events, and social sharing information to spread the word! Even when the attendees have packed up and left town, your event isn’t over. Capitalizing on the energy and enthusiasm that went into your event—whether it’s a week-long conference or an hour long webinar—is critical to encouraging attendees to return once more (and to share their amazing experience with your brand on social media). 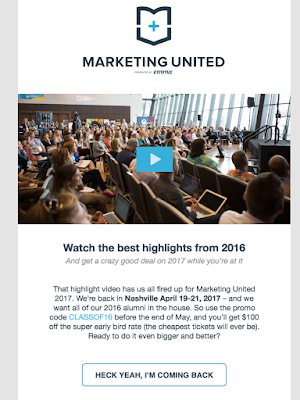 This great example from Emma landed in our inboxes a few weeks after Marketing United in Nashville. Starting with the subject line, “Remember this?” (curiosity gap alert!) their recap video and highlights makes you go straight back to those inspiring moments. The best part about the email is that it automatically creates a community. The coupon code “Alumni16” makes you feel part of something bigger than yourself, exactly like attending university. Sending the email several weeks later, rather than days, allowed the buzz and excitement to wear off (as well as the travel exhaustion) while not waiting so long that subscribers can forget what the conference was about. 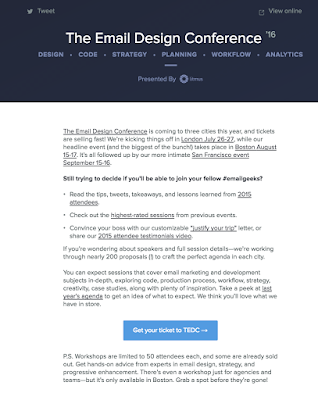 BUILD YOUR OWN AMAZING EVENT EMAIL TEMPLATE…OR USE OURS! If you’re looking for templates to use as the basis for your email campaign, the Litmus Community now features modern, easy-to-use templates built by industry veterans. 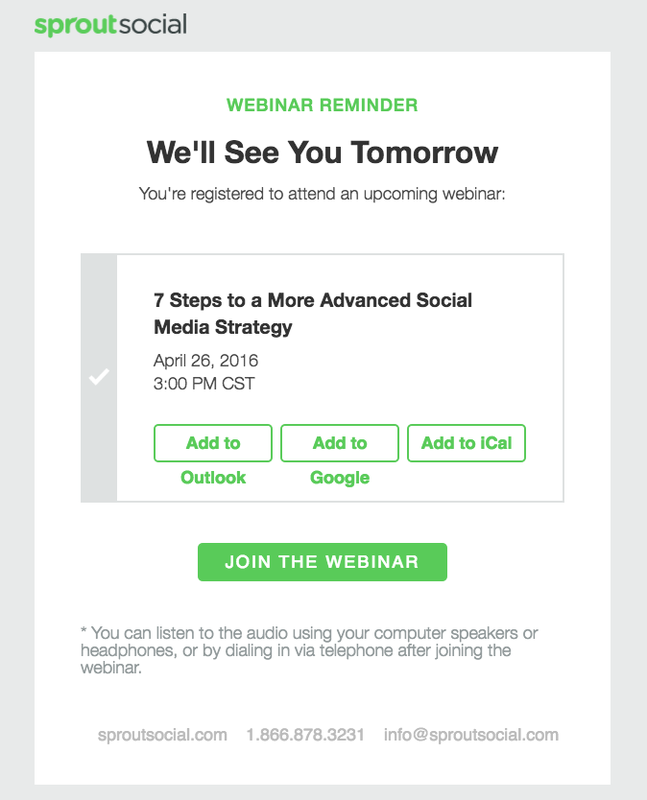 Find the perfect template for your new webinar, conference, and everything in between.